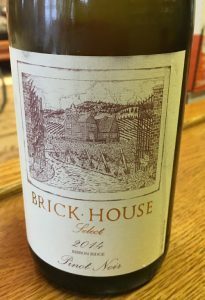 2014 Brick House, Pinot Noir “Select” Ribbon Ridge, Willamette Valley, Oregon. Doug Tunnell’s entry level all estate Select Pinot from the near perfect 2014 vintage is a lovely and pretty wine, easy to admire for it’s silky texture, open knit style and elegant delicacy. From hand picked barrels from various blocks the Select gives a hedonistic insight into the vintage and the Brick House vines, all organic and biodynamic, Tunnell has a wonderful selection of heritage clones and newer dijon clones to work with and has put together a joyous and complex wine that dances on the palate with with lacy red fruits, spice, earth and mineral tones. While the higher end cuvees will no doubt give more forceful intensity and be classic Pinot Noirs for the cellar, this Select 2014 will be a graceful medium weight wine to enjoy now with bing cherry, loamy earth, plum, mixed floral notes and subtle oak shadings making for a dreamy offering, this poised and detailed Oregon Pinot is an outstanding value. The nose lifts from the glass with wilted rose petals, faint violets, flinty/pepper spice, cinnamon and wild plum leading to the soft and round palate of cherry, raspberry, blueberry, tangy red currant and earthy strawberry fruits that while on the light side linger on and on, this is very classy stuff. This will entice and thrill most Pinot Noir lovers, with subtle savory elements adding further appeal, including hints of saline, iron and cedar that integrate nicely, drink this beauty over the next 3 to 5 years easy, though I wouldn’t be surprised to see it go 10 or 15 years without any problem, a superb effort from a top producer and a real bargain!